Williams begins with some helpful introductory comments that include the definitions of terms, the way exegetical argument should proceed, the use of expert opinion when examining a text, some background to the study, as well as the bias of the author. These introductory comments are invaluable because they help set the stage for general readership to critically interact with the scholarly discussion that follows. Throughout the text, quotes are often provided in Greek, but Williams not only provides the translation of these texts, he also highlights them to provide people who don't know Greek with a means by which they can examine the letters of the Greek itself. Similar helpful means to convey scholarly material in a readable fashion are used throughout the book. The book is laid out to explore three critical questions related to the verse: 1) was the person mentioned in the verse a woman? ; 2) was this person merely a "messenger" or an "apostle"? ; 3) was this person "among" the apostles or "known to" the apostles? Whether Junia was actually Junias (or some masculine variant) is the first question Williams tackles. He frames his argument around three significant works—an article from the Council for Biblical Manhood and Womanhood, a chapter from the book Rediscovering Biblical Manhood and Womanhood (edited by Wayne Grudem and John Piper), and arguments provided in Evangelical Feminism and Biblical Truth by Wayne Grudem. Each argues that either the person named in Romans 16:7 was a man or we can't determine with certainty that it was a woman. These works provide twenty arguments that Williams tackles individually or in groups. That Junia was a woman is the result of Williams' careful critical study of these twenty arguments against Junia being female. He provides significant analysis of the Church Fathers' comments on this passage. He also analyzes various versions of the name in contemporary literature, and looks in-depth at the textual critical issues surrounding the Romans 16:7. From his research, it seems essentially unquestionable that Junia was a woman. Some have contended that Junia was a messenger as opposed to an apostle. Williams provides a significant case that ranges across uses of the Greek word, apostolos, in the rest of the Pauline corpus to the Church Fathers, Bible translators, lexicons, and commentaries. This case makes it clear that the use of the term in the passage is best translated as "apostles." Finally, the question of whether Junia was "among" the apostles as opposed to "known to" the apostles is the subject of the latter part of the book. The ESV translation of the Bible, for example, translates Romans 16:7 in such a way as to make Junia (and Andronicus) known to the apostles. Williams analyzes the arguments made for this alternative translation and finds them wanting. In this section he is extremely lucid: the case is almost entirely based upon a study which concluded that Junia was "known to" the apostles instead of included among them. He examines this study page-by-page and shows that not only is the use of language in the study potentially obfuscating, but the methodology was questionable. Moreover, in a detailed look at several examples provided, Williams demonstrates that these examples do not support the notion that Junia would have merely been an acquaintance of the apostles. He also demonstrates that counter-examples were not given much attention and that the case for Junia being among the apostles is, in fact, quite clear. Overall, Williams has done a great service to forward the exegesis of this hotly contested verse. He has provided compelling reasons to believe that Junia was a woman apostle as well as solid counter-arguments to those who would allege otherwise. The fact that the book is written in such a way as to be accessible to a range of interested readers—it provides the resources for laity to follow along as well as the critical engagement with the best scholarship-makes it an absolute gem. 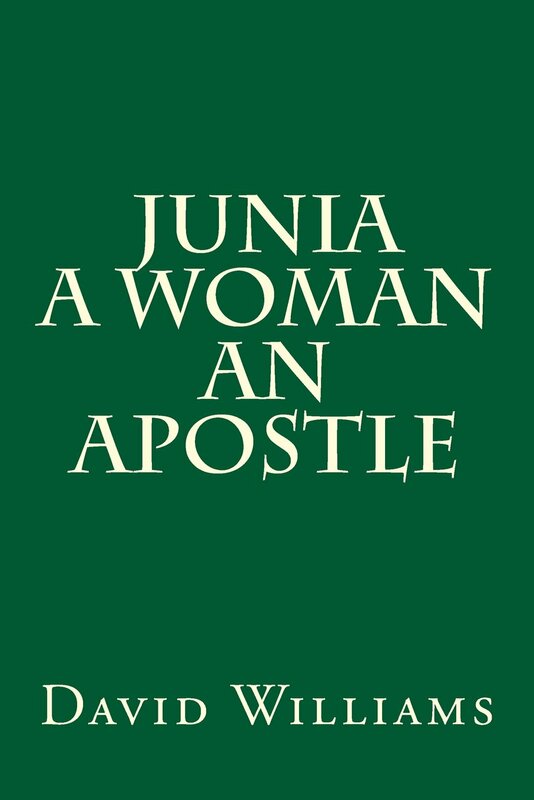 Junia, A Woman, An Apostle is an invaluable work which should be kept on the shelf of anyone interested in the debate over women's role in leadership. The question of Junia's status among the apostles is now settled.